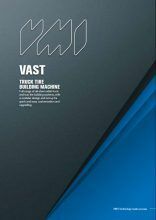 The VMI VAST is a comprehensive platform of single stage all-steel truck and bus tire building machines, producing repeatable, top quality tires combined with a high machine output. The VAST modular design allows for quick and easy customization ensuring that you have the right machine for your specific situation against an economical investment. The VAST produces everything from standard sized green tires to more sophisticated super single tires, either tubed or tubeless, from 17.5” – 24.5”. Daily outputs of up to 550 tires can be achieved depending on machine configuration, degree of automation, number of tire components, tire design and type of compound used. The VAST system comprises several main modules. The four drum single stage tire assembly module consists of the belt & tread drum, the carcass drum, bead loader and a rotation unit with two mechanically synchronized shaping drums. 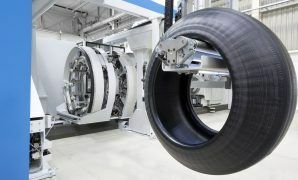 The overhead project frame is fitted with laser-light guide units to assist the operator in controlling the tire building process. 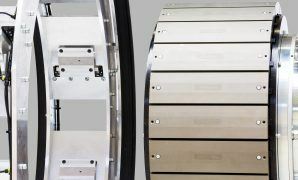 The belt & tread side on the left side of the machine consists of a belt & tread drum housing which moves along the track and makes vertical movements to pick up belts 1 to 4 and the tread component. This enables the use of fixed belt and tread applicators, creating a more consistent and accurate application process. 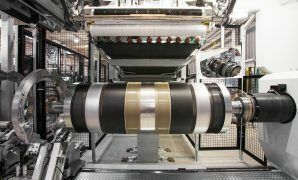 The belts are actively centered by VMI’s VVS system before transporting them to the belt & tread drum. The drum housing moves the drum to the applicator and, if necessary, makes corrective movements during the application guided by VMI’s VVS. A pre-cut tread applicator is situated in front of the belt & tread drum. This applicator includes tread end heaters and optionally tread length compensation for hands-off application. Tread length compensation ensures equal stretch and distribution of pre-cut tread over the circumference of the belt & tread package, creating a proper tread splice and resulting in improved tire uniformity. The carcass side on the right side of the machine consists of a fixed carcass drum housing. The components are mostly automatically applied, cut and spliced. 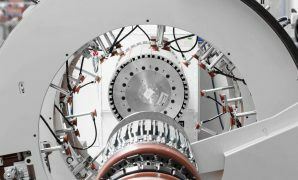 The moving transfer unit which holds the beads picks up the carcass package and transfers the package to the shaping drum. The pre-cut belt cushion will be applied on a flat carcass on the shaping drum that is mounted at the front side of the rotation unit in the middle of the machine. During rotation to the back side, the carcass will be shaped after which the belt & tread package is positioned over the shaped carcass. The combi stitcher consolidates the belt & tread package with the shaped carcass to finish the green tire. Situated between the belt & tread drum and the shaping drum, the green tire removal unit automatically removes the green tire from the transfer ring. After inspection of the green tire, it is placed on a pre-determined position by the operator.